Porsche will be giving itself an excellent present for the 70th anniversary of its sports cars: the 911 Speedster Concept is a road-ready study of an open-top and particularly exciting sports car. It forges a link between the very first Porsche 356 ‘No. 1′ Roadster, which received its operating permit on June 8, 1948, and the Porsche cars of today. With its pure concept and historically accurate execution, the 911 Speedster concept reflects the brand essence of the Stuttgart-based sports car manufacturer with precise clarity. A pure driving experience is the main emphasis of the car. The drive technology under the two-tone shell of the concept study is derived from the current GT models. It was developed at the Porsche Motorsport Centre, which is the birth place of the 911 GT2 RS and, most recently, the GT3 RS. 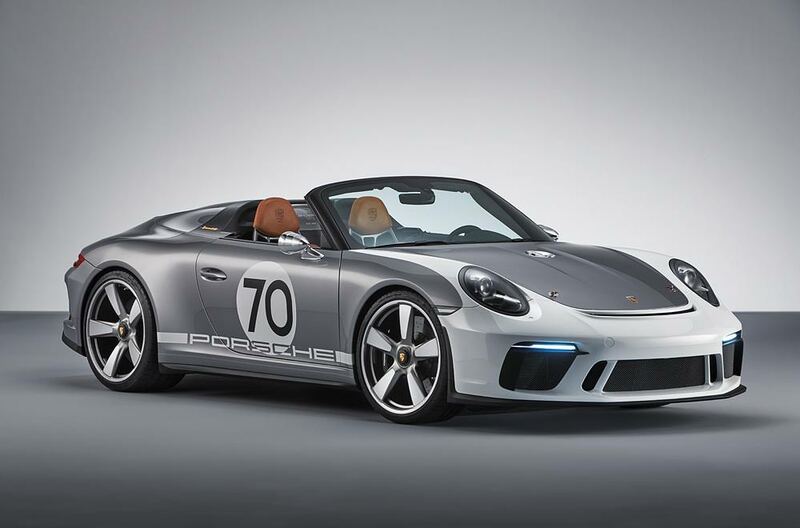 The 911 Speedster Concept celebrated its world premiere as part of the official ’70 years Porsche sportscar’ anniversary celebrations in Zuffenhausen. The concept study offers a glimpse of a potential series-production version, although this model may not be presented until 2019. A decision on whether to move ahead will be made in the coming months. The characteristics of the 911 Speedster Concept include the shorter window frame with a more inclined windscreen and correspondingly shortened side windows. These features give the sports car study an even stockier profile with a very low fly line, which is reminiscent of its predecessors such as the Porsche 356 1500 Speedster. A special rear cover made of carbon fibre connects behind the front seats, covering a roll-over protection structure and featuring a ‘double bubble’, a traditional element of this sports car design since the 911 Speedster from 1988. Two contrasting black slats between the ‘humps’ add an aerodynamic touch, and a transparent Plexiglas wind deflector features an engraved ’70 years of Porsche’ logo. The sports car manufacturer is also celebrating this anniversary with numerous activities around the world throughout 2018. Tomorrow, June 9, Porsche will be inviting fans to its Sports Car Together Day at all of its sites around the world. On the weekend of June 16-17, the sports car manufacturer will host employees, residents of the Zuffenhausen district and prospective customers at a celebration in and around the plant in Stuttgart. The Festival of Speed, held from July 12-15 at Goodwood in the UK, will also celebrate the anniversary, as will Rennsport Reunion in California from September 27-30. The celebrations will conclude with the “Sound Night” event which will be held for the first time in the Porsche Arena in Stuttgart on October 13.